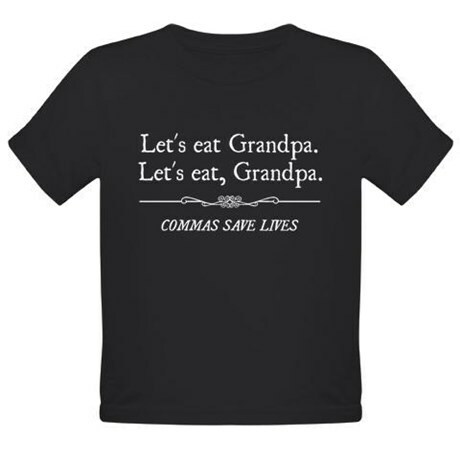 Here’s the best joke I’ve seen to explain the need for the correct use of a comma. It involves Grandpa. Where would we be without cats on the Internet to explain everything? 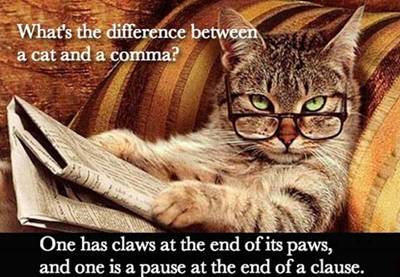 Poetic cats with reading glasses show us how to understand the fundamental use of the comma. Writing relies on grammar, and grammar relies on punctuation. A new book by Noah T. Lukeman, A Dash of Style, breaks down the use of all those marks that offer so many options we use to give our writing its clarity. From clarity we get to sense, from sense we get to meaning. We go onward to mood, tone and voice, once we can establish meaning. This is the pyramid of language, the way to express ideas, sensations and feelings to readers. It all relies on punctuation, which is worth some practice. Before you invest the $15 in the book, you can look over some excerpts of Lukeman’s writing about using quote marks at The Writer’s Store, a Web outlet that sells writing texts, software such as Dramatica and Final Draft, and much more. Lukeman calls quotes “the trumpets of writing” because they ride above the words.